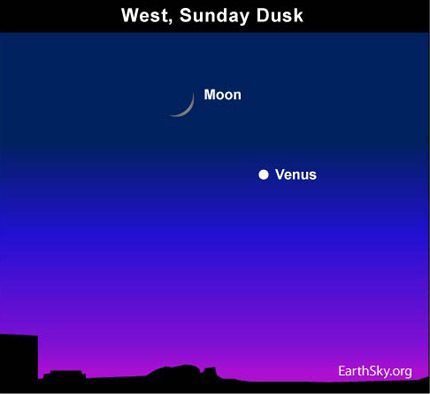 As seen from parts of southeast Asia, the moon passes in front of Venus at about 10 hours Universal Time today. Unfortunately, this is not visible to North American or European observers, but we have not lost out entirely. Tonight, just as it gets dark, look to the western sky and, weather permitting, you should see a beautiful sight — bright Venus with the waxing crescent moon nearby. You should have no trouble finding either object as long as your skies are clear and you are facing west. Venus is a brilliant beacon to the lower right of the moon. Look early, as the two set less than three hours after the sun. By the way, the moon is currently said to be “waxing” in the sense that it is becoming a bit more full each evening. If you are a regular reader of EarthSky Tonight, you may have noticed over the years that we have reported passages of the crescent moon near Venus several times. In fact, it is not that unusual. The moon passes somewhere near Venus about once a month, although we don’t always mention it simply because the conditions for observing are not always favorable. However, what you have not ever seen is a mention of the quarter moon, or gibbous moon, or full moon passing near Venus. Yet, we sometimes report when these phases of the moon pass near Mars, Jupiter and Saturn. So why is it that only the crescent moon ever passes Venus? That is because Venus is “inferior.” No, I don’t mean that it is less valuable in any way. Used in this context, “inferior” means “lower than.” Venus is “lower than” the Earth relative to the sun. In other words, Venus is closer to the sun. Because of this, Venus never appears very far away from the sun in Earth’s sky. It oscillates back and forth from one side of the sun to the other, much like a race car moving from the left side to the right side of a circular track as we watch it from the stands. Thus, Venus sometimes appears in the evening twilight, and sometimes in the dawn twilight. The point is that it is never far from the sun. The farthest it can get from the sun (called an “elongation”) is slightly more than 47 degrees. Therefore, when the moon appears to pass Venus, it does so at about the same elongation from the sun. Since 47 and fewer degrees correspond to a crescent phase, only the crescent moon can appear to pass near Venus in the sky. The quarter moon is 90 degrees from the sun, and the full moon is 180 degrees, so you will never see those phases near Venus. Mercury is an inferior planet as well, but its maximum elongation is only 28 degrees, so only a very thin crescent moon can ever appear near Mercury. On the other hand, Mars, Jupiter and Saturn are farther from the sun than Earth, making them “superior.” From time to time, they can appear at any angle from the sun, and the quarter or full moon phases can pass near them (sometimes even occulting them).